After visiting vacant new malls in China, I was naturally intrigued to know the rationale behind this Chinese mall IPO on the Singapore Exchange, which was originally scheduled to go public in March 2011 but was then delayed until June 9th and priced 30% lower. The rationale may become more apparent by the end of this post. The press release stated that “PCRT offers investors the unique opportunity to participate in urbanisation-driven retail growth opportunities in China via a private-equity fund structure, typically accessible to only large institutional investors…PCRT's initial portfolio comprises five assets located in Shenyang, Foshan and Chengdu. 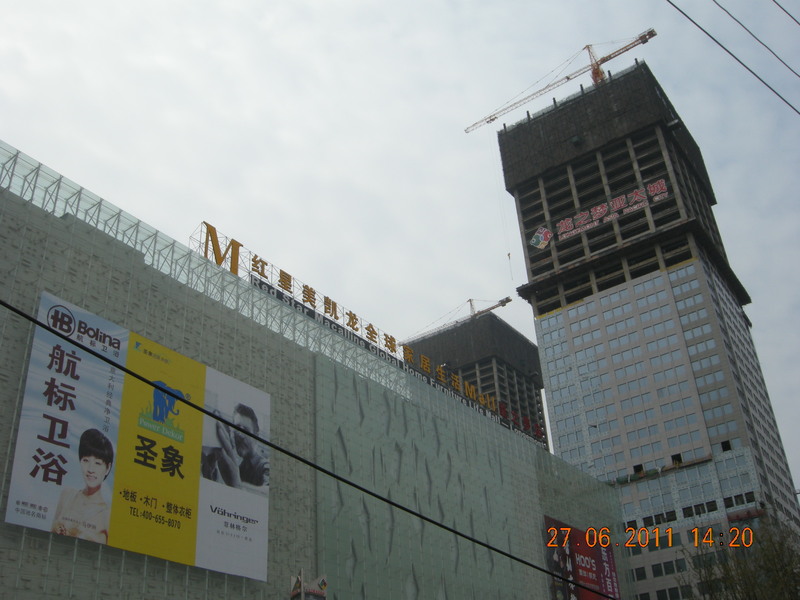 The assets are Shenyang Red Star Macalline Furniture Mall, Shenyang Longemont Shopping Mall, Shenyang Longemont Offices, Foshan Yicui Shijia Shopping Mall and Chengdu Qingyang Guanghua Shopping Mall, and have a total gross floor area of approximately 960,899 sq m [10,343,369 square feet] and a total valuation of approximately S$1.1 billion as of December 31, 2010. 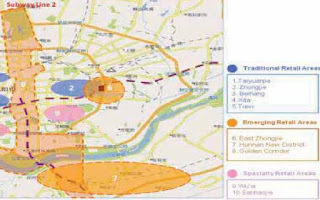 …” The common special attribute for each property is that it will be served by either rapid transit or high speed railway stations. Only one of these projects has been completed -- the 3 million square foot Shenyang Red Star Macalline Furniture Mall, a nine-story furniture mall which opened last September and was reportedly 91.8% occupied by the end of the year. This mall exclusively sells home furnishings, building materials and furniture. The property manager is Red Star Macalline Furniture, China's most successful furniture retailer, with 66 stores throughout China, double the number of stores open in 2007. Red Star Macalline has been successful in wealthy Chinese cities such as Shanghai (GDP per capita of $23,000); can it be successful in poorer cities such as Shenyang (GDP per capita of $9211)? China Daily reported in March that home improvement retailers in China are facing growing challenges. French retailer Saint-Gobain recently shut down all its Shanghai stores, stating that "the individual demand for interior settings is dwindling since more housing and apartments will be sold with interior decorations. Our business, which is based on individual demand, becomes increasingly difficult." Likewise, Home Depot has closed 5 of 12 stores in China, and British home improvement chain B&Q has closed 22 stores (including Shenyang) and reduced the size of 17 stores out of a total of 63 stores in China. Perhaps the foreign retailers don't know how to compete with Chinese retailers, but a recent statement from a VP at China Building Materials Circulation Association sounds ominous: "The need for building materials is falling because people, even those needing houses to get married, are watching the property market instead of buying houses and decorating them. They expect housing prices to fall significantly." That's the problem with the home furnishings and building materials industry -- it is dependent upon a robust housing market, and if that market were to deflate, like it did in the U.S. and U.K., the home furnishings industry would deflate, too. This would suggest that furniture malls could experience increased vacancies during the next Chinese recession, just as many furniture retailers failed during the U.S. housing bust. Meanwhile, Standard & Poor’s cut its outlook on Chinese real estate developers to “negative” from “stable” on June 15 because of government tightening of credit markets, which may lead to further rating downgrades in the next year. The Chinese government has increased the required reserves for bank lending on commercial real estate nine times in a row. Realistically, though, could one really put over 800 competitors together and expect all to survive? Red Star isn't a conventional mall with tenant complementarity. Another, more fundamental question to ask is whether China is really wealthy enough to support the large number of luxury shopping malls being built at one time, considering that the median household income there is only about 10% of U.S. median household income. The even-larger, adjacent, Shenyang Longemont Shopping Mall (3.5 million square feet) is scheduled to open in the third quarter and was said to be only 51.8% pre-leased to 185 tenants at the time of publication of the prospectus. The other projects will not be fully completed until the end of 2014. PCRT also claims to have S$3 billion (Singapore dollars, worth about 81 U.S. cents) worth of purchase options for commercial sites next to the coming High Speed Rail in China. If that statement doesn't make sense to you, you can understand why I'm skeptical, too. I would have more confidence if Mr. Pua just said, "I want to build profitable malls" rather than "I want to make a 'pure play' on Chinese retail." The latter statement resembles the talk of a gambler rather than a businessman. Bernie Madoff also liked to use the word "arbitrage." One must also never forget that these are all leasehold properties, with ground leases expiring in 38 to 40 years, which reduces the prospects for long-term capital appreciation. This is China, remember; everything is leasehold. Yet Pua's justification for the initially below-average yield was the superior prospects for capital appreciation in this property portfolio. That's 587,000 square meters (6.3 million square feet) of adjacent competitors within the Longemont Asia Pacific Centre development. What will vacancy rates be like one year from now? Will these new malls and department stores draw away tenants from the PCRT malls? From Savills Research and Consultancy -- The red square represents the three Shenyang projects situated in East Zhongjie. As for local spending power, the study indicates annual retail expenditures per capita of just RMB 8926, or about $1377 USD. Is this supportive of “mid to high end retail”? There seems to be a misconception among foreign investors that most Chinese people are now affluent. "Given the expectation for continued strong economic growth and growth in personal incomes, the impact of any ‘oversupply’ is likely to be reasonably short, with the market adjusting over the following couple of years." This would imply that a quadrupling of retail space in the neighborhood could be matched by a quadrupling of local retail spending within two years. Anyone who has completed Lesson 1 of Economics 101 would be skeptical of such a conclusion. The report lacks quantitative analysis of supply and demand, such as a forecast of local retail space absorption or vacancies, and this verbiage is similar to the positive feasibility studies done to justify failed projects in Las Vegas, Arizona and Florida. Despite the deluge of new space being developed, the Sponsor has assumed a 1% vacancy rate for the retail malls, continued 6% annual growth in rental income and 15% annual growth in retail spending. The Red Star Mall has opened to reported occupancy of 91.8%, but will a one-concept mall have staying power, particularly if the housing market was to recede? As far as the talk of “yields you can see” is concerned, only the Shenyang Red Star Mall is producing income at the moment, and the malls in this trust will not be fully operational until the end of 2014. The IPO sponsor has forecasted a 5.3% yield in 2011, a tall achievement from mostly unfinished malls. The first distribution will be from the Earn-out Deed, which was taken out of the offering proceeds and is thus a return of capital and not a return on capital. The use of an IPO on a foreign exchange to get financing is a result of the Chinese government’s crackdown on commercial real estate lending by banks. Escalating reserve requirements have hamstrung the ability of Chinese banks to lend on commercial real estate development, so developers must look outside China for financing. Somehow, sponsoring a risky real estate project on a foreign stock exchange gets taken seriously as an investment grade project. The PCRT portfolio was valued at the equivalent of S$1,132,906,000 as of December 31, 2010, and the initial IPO was scheduled to be 1.1 billion shares priced at S$1 per share. The IPO was then postponed until June and finally fully subscribed, selling 1,121,695,000 shares at 70 cents per share (SGD), or S$785,187,000, 30% below the previously appraised value of the properties. The S$1.1 billion valuation seems questionable, though, if it is meant to represent the current value of the intended PCRT portfolio as of December 31, 2010, as the independent valuation report does not disclose until the Appendix that the estimates of value were based on hypothetical conditions, mainly that all 5 properties were built, fully leased, and fully owned by PCRT. The only open and leased property, the Shenyang Red Star Mall, was valued at about $186 SGD psf, but the other incomplete or unbuilt properties were given similar appraised values. The incomplete Shenyang Longemont Mall was valued at S$187 psf and the incomplete Longemont Offices were valued at S$193 psf. The unbuilt Foshan mall was valued at S$205 psf and the unbuilt Chengdu mall was valued at S$156 psf. These estimates of values could not be reflective of the condition of these properties on December 31, 2010, making the valuation report misleading and inaccurate, as two of the five assets are currently just purchase options for projects that have not yet been developed. Such a valuation report, if published in the U.S., would be considered a "misleading report" in violation of U.S. appraisal and banking laws. In the U.S., prominent disclosures of such hypothetical conditions affecting appraised value are legally required to be in the body of the valuation report; it surprises me that squeaky-clean Singapore does not require disclosure of misleading “hypothetical conditions” for a public IPO. Moreover, the valuation report in the prospectus did not even consider that PCRT was acquiring only a 50% interest in the Shenyang properties, so they mistakenly valued the portfolio for 10.152 billion RMB (about S$1,932,000,000) and PCRT was the one to make the adjustment for 50% ownership in the prospectus. Investors need to realize that whenever an IPO sponsor orders an independent valuation or feasibility study, that study cannot be considered truly “independent”. The only independent study investors can rely on is one they order for themselves. Sorry to say this, being a valuer [appraiser] myself, but too many valuers are paid whores. 1. An annual base fee of .35% of appraised value up to S$10 billion. Based on the inflated CBRE valuation of $1.1 billion, the Sponsor would be owed S$3,850,000 this year. Will the Sponsor keep hiring this same valuation firm? 2. A performance fee of 4.5% of net property income (on top of the management fee paid to the actual property manager, Red Star Macalline). 3. An annual trustee fee of .03% of appraised value, or S$330,000 this year. 4. An acquisition fee of 1.35% of the acquisition price of the properties in Shenyang and Foshan ($820,000,000 SGD), which would provide the sponsor another S$11,000,000 in compensation. 5. Development and property manager’s fees of 2% of gross revenues + 2% of net property income + .5% of net property income. 6. Leasing commissions of two months’ gross rent for newly completed or renovated buildings. 7. A divestment fee of .5% of the sale price of any real estate sold or divested. The prospectus also indicates that PCRT's sponsor will earn S$141,800,000 in acquisition and development fees for the Chengdu Mall and S$121 million for the Foshan Mall. So development seems to be a profitable option for PCRT's Sponsor, no matter what. My overall opinion of PCRT is that it is bad for investors, but good for the sponsor. While advertised as a "pure play" on the Chinese retai sector, it is also a pure play on Chinese real estate development at an inauspicious time. For instance, Standard & Poors has just reduced its outlook to "negative" for Chinese real estate developers due to Government efforts to restrict bank lending to them. My skepticism does not count for much. What does the market think? The IPO was originally priced at S$1 per share, then 70 cents SGD per share. Trading in PCRT on the SGX started on June 9th at 65.5 cents per share, and in the two weeks since the unit price has declined to 58.5 cents per share for a market capitalization of S$656,191,525, which is 42% below "valuation". Disclosure: I have no short or long position in this stock. Where To Locate Your China Retail. Wake Up And Smell The Coffee. Literally?